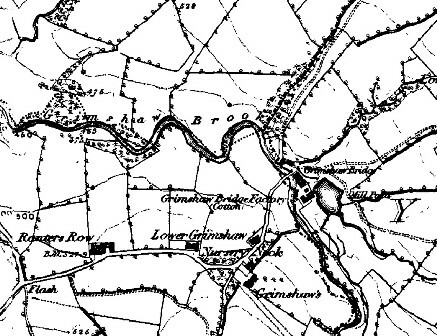 Edmund was born in Lancashire, probably Lower Darwen, in 1773. It seems highly likely he married Margaret Eccles on 4th June 1798 at St Mary the Virgin, Blackburn. I say highly likely because the parish records says he is called Edward and not Edmund. However, I have found in a lot of my research that Edward and Edmund are sometimes interchangeable. There does not appear to be any other marriage records of a similar date which include Barnes and a Margaret. Furthermore, my research into Margaret Eccles, shows she was baptised on 25th December 1776 and was the daughter of Mark and Mary Eccles. Given that Edmund and Margaret have children called Mary and Mark this makes it seem even more likely that this is our Edmund and Margaret. Edmund and Margaret's first child, Mary, was baptised at St James Chapel on 23rd June 1799. All of their children, with the exception of Betty, were baptised at St James and it is from these records that we get an idea of where the family lived. 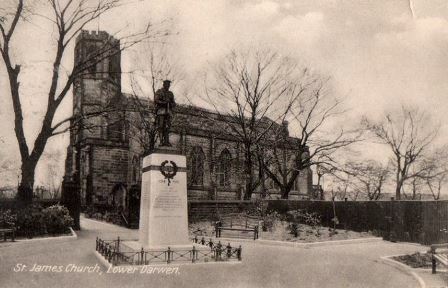 It is likely they lived in Over Darwen until around 1804 when their second daughter, Alice, was born in Lower Darwen. Whilst they were in Lower Darwen three more of their children were born: Mark (1806), Ann (1808), and John (1810). The family then moved to Tockholes where they were living in 1812 when Betty was born; she was the only child to be baptised at St Stephen's. The records show she was born on 14th April 1812 and baptised on 17th May 1812. 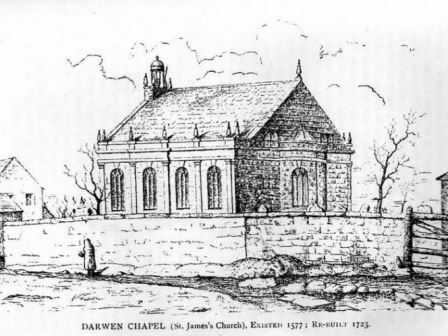 The next two children, Margaret (1814) and Edmund (1816), were also born in Tockholes but were baptised at St James, Over Darwen. The population in Tockholes at this time was the highest it has ever been at 1261 well over double what it is today. Photograph from	Cotton Town digitisation project. Edmund Barns is now 68 and a cotton weaver; Margaret is 65. Their daughter, Alice, 30 and her two children, Martha, 10 and James, 6 are living there; it is likely Martha's real age at this point is 14. Their sons, John 25 and Edmund 20 also live with them, both of whom are labourers. Andrew, aged 15, who is a bleacher, is also there. Edmund dies in 1844 aged 72 - I still need to acquire the death certificate; Margaret dies two years later aged 68 and it states on her death certificate that she is 68 and the widow of Edmund Barnes. She died from old age and the informant, who was in attendance, was Joseph Birch. I can only assume Joseph is a neighbour and although I have looked I cannot find anything about anyone with this name in Darwen. I must admit, I find it odd that a family member did not report the death. I cannot find any more information about Mary. 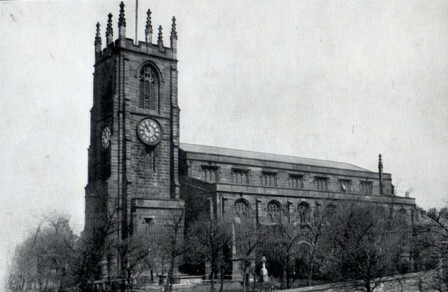 On 30th September 1833, Mark marries Ellen Morris at the parish church of St Mary the Virgin in Blackburn (now Blackburn Cathedral); they both sign with a mark showing they cannot read nor write, Mark is a weaver. They have at least nine children: Andrew (b.1835); Mary (b. 1837); James (b.1838); Anthony (b. 1840); William (b. 1843); Edmund (b. 1845); John (b. 1847); Margaret (b. 1852); and James Henry (b. 1856). I cannot find their baptism records. In the 1841 census they are living next door to Mark's parents in Ratner Row, Eccleshill; Mark is a cotton weaver. In 1851 they are still in Eccleshill, not far from the Handel Arms pub (this comes next on the census). Mark has changed his job, he is now a potter's labourer; Ellen is 37; Andrew is 16 and an earthernwear turner of pots; Mary is 14 and a tenter for power loom; as is James who is now 13; at 10, Anthony is a coal miner drawer; and William, aged 8, couples of tubs for coal miners; Edmund is 6; and John 4. Mary Morris, Ellen's mother aged 67 is also living there. Coal mining had been going on in Eccleshill for many years. 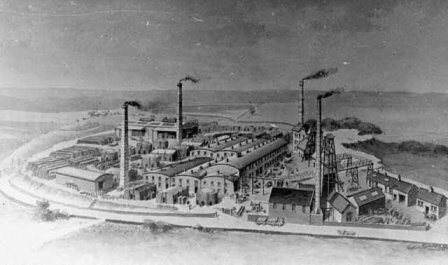 It is likely Mark and Andrew worked at the Eccleshill Pottery. Mark dies, at the age of 52, in 1858. In 1861 his family are living in Holden Fold (which is where my mother was living when she died). Ellen is 46 and a widower; Anthony 21 and a coal miner; William is 19 and Edmund 15, both are cotton weavers; Margaret is 9 and is also working in a cotton mill as a tenter. James Henry is 5. Ellens mother, now 81, is still living with the family. There is also a Mark Rothwell aged 1 living there. I cannot find any of the family after this date. There is an Ellen Barnes marries a William Taylor and they are in Blackburn in the 1871 census but I am not sure if this is Ellen. Apart from Ann's baptism on 10th January 1808 at St James I cannot find any more information. It is much easier to follow the boys as the girls usually get married and take their husband's names; it is easier to follow the girls after 1837 when marriages, births and deaths have to be registered. John Barns marries Susannah Watson at St Mary the Virgin, Blackburn in 1845. They have five children: Elizabeth b. 1848; Thomas Edward b. 1850; Andrew b. 1852; Margaret b. 1855; and Esther b. 1862. In both the 1851 and 1861 censuses the family are living at Rakes Bridge in Lower Darwen. We know from the 1911 census that Elizabeth and John have ten children but only six survive: Betty, b. 1870; John, b. 1872; Thomas, b. 1873; Mary Jane, 1876-1914; Esther, b. 1880; Elizabeth b 1886. 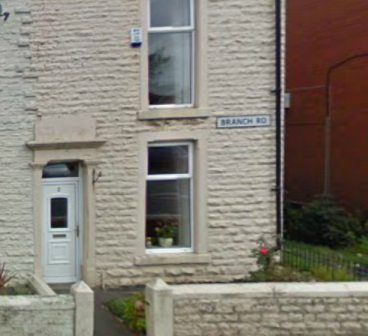 The family live in Branch Road, Lower Darwen for over 40 years, merely changing houses from number 9 to number 1 to number 2. Her husband John dies aged 42 in 1887. Her uncle Thomas E lives with her family for nearly thirty years; he dies in 1910. In 1911 they are living at 2 Branch Road. Mary Jane is still single and 35, she is a cotton winder; Elizabeth is 24, still single and a cotton weaver; Thomas is 38 and a railway company labourer, he is a widower and his son, John, aged 5, is also living with the family. They also have a boarder called Phoebe Alice Ashton who is 30 and a cotton weaver. Thomas Edward stays single and lives with his niece and their family in Branch Road, Lower Darwen until his death in 1910. They have 15, yes 15, children but only 11 survive: John b. 1872; Charles b. 1874; Susannah b. 1875; Thomas Edward b. 1878; Mary b. 1880; Joseph b. 1882; Elizabeth b. 1884; Lily b. 1886; Esther b. 1887; Beatrice b. 1890; Bertha b. 1892. For most of this time they live at 10 Paradise Street then move to 24 Sandy Lane then in 1911 they are at 4 Branch Road, next door to Andrew's sister, Elizabeth. I don't know what happens to Margaret or Esther. I don't know what happened to Betty and Margaret. Thanks to Andrew Bennett, another family researcher from Blackburn, I now have lots of information about Edmund Barnes and his family and because of this I have set up a separate page. At first I thought Andrew Barnes was the illegitimate son of Alice Barnes as I could not find any baptism for him; I also thought Margaret was too old. However, I have now found the baptism records which show that he was born 21st April 1821 and baptised at St Mary the Virgin, Blackburn, on 8th July. The records states that his parents are Edmund and Margaret Barnes of Eccleshill. I still think it odd that Andrew is baptised here when the rest were baptised at St James in Darwen. Whilst Andrew is down as 15 in the 1841 census (he is clearly 20) and is a creeler, I cannot find any further records for him.